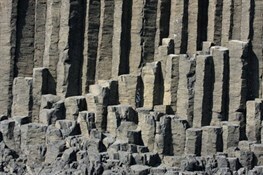 The fantastic precision of Nature's work in building up the basaltic columns on Staffa is due to the steady cooling of flows of lava as they came into contact with a colder bedrock and were exposed to the even more chilling effects of the weather of northern Scotland on the outer surfaces. By some fluke of contraction on cooling the result is perfect, mainly hexagonal, columns. Curves in the columns were caused by the shape of the underlying rock over which the lava flowed. Sometimes close inspection of the columns reveal whitish deposits between the joints, almost as though they were cemented. In fact, this is caused by salts such as calcite which were squeezed out of the basalt by immense forces of contraction as the rock cooled. In the rather severe words of The Nature Conservancy it is a "spectacular example of columnar jointing in Tertiary plateau lava flow". In 1973 it was declared a Site of Special Scientific Interest. About 60 million years ago intense volcanic activity in the area led to a blanket of lava being fed far out into the Atlantic. Most has been eroded and dispersed, but Staffa, the Treshnish Isles, and other small islands have remained as stubborn outcrops. This is, of course, a simplification of a complex, still unfolding geological story. 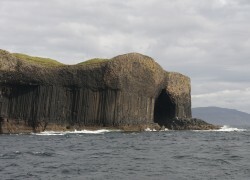 Staffa consists of three layers of rock of different types, covered with a surface of rich soil and lush grass. The lowest layer is tuff, compressed volcanic ash and dust, the middle layer is composed of the basaltic columns, and the uppermost is made up of jumbled and fractured columns and volcanic debris. The whole structure is best appreciated from the sea a little way off the south of the island. A slant of some four degrees downwards from west to east, caused by disturbance deep down after the columns had been created, is apparent. The lifting of the tuff above sea level on the western portion provided the opportunity for the sea to exploit areas of weakness and create the three main caves there. The columns were formed within a single, massive flow of lava as it cooled and solidified in a very gradual, controlled manner. As the material cooled its volume shrank slightly and the narrow spaces which separate the columns were created. Theoretically, every column should be perfectly hexagonal in section if the cooling process had occurred uniformly but there would have been a multitude of minor variations in the rock itself and in its pattern of cooling, leading to the considerable variety in column size and form that we can readily detect. 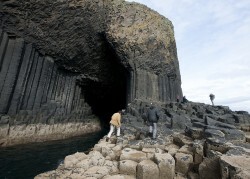 Staffa's exceptional geological features are recognised as being of outstanding importance, and the whole island's ecosystem which embraces its rock, soil, climate, topography, and the influences of its marine location, is precious.